$90, TheaterMania discount. I had come up just short of the rush earlier in the week and didn't want to risk missing this show on my last day in the city! I was amazed to see that I scored fantastic ninth row right orchestra seats. My final verdict? Back off, haters, because this one's a rave. Catch Me If You Can is absolutely delightful. Catchy and exuberant music and choreography combine with an engrossing and quick-moving plot and completely winning performances to create an infectious and thoroughly enjoyable show. It felt, most of all, like this team successfully combined the old-fashioned musical with the modern musical, creating a show that didn't break any molds or do anything brand new, but rather took the old model and tweaked it until it worked for 2011. That is a feat, to be sure, and I loved every minute of it. I had never seen the film, so those whispers I heard at intermission from audience members who felt this strayed too far didn't mean anything to me. 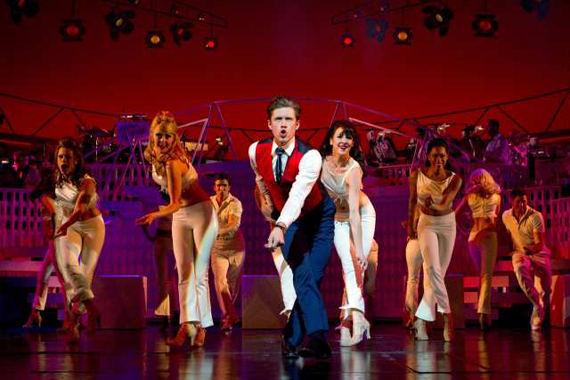 What I found was a story set mostly in the past that still felt very fresh thanks to Aaron Tveit as Frank Abagnale, Jr. (more on him in a moment). Young Frank learns early on that amazing things happen when you not just pretend you're someone you're not but actually believe it yourself, and the unbelievability of his adventures as an (unlicensed) pilot, doctor, lawyer and more are rivaled only by his exploits' real-life repercussions for his father, the FBI agent assigned to his fraud case, and the many other lives he affected. The core conceit here is that young Frank is telling the audience the story, jumping in and out of narrating and participating in the action. It works because of Frank's showmanship - it's not a stretch at all to believe that the intricate song and dance that was his life would manifest in literal song and dance. As Frank, Tveit's musical numbers are ebullient, over-the-top, and dripping with charisma. Likewise, the deeper FBI agent Carl Hanratty (Norbert Leo Butz) gets into Frank's case, the more fantastical his performances get. It's a clever tool to show how far Hanratty has fallen into Frank's rabbit hole. The book and music combine seamlessly to illustrate how the two men have impacted each other's lives, and only rarely move too far beyond a subtle guiding hand through this complicated relationship. As Hanratty, Norbert Leo Butz is every bit as good as you'd expect him to be. It's too bad there aren't more words available to compliment his performance, but the reality is that at his level, the only thing I can say is that he met my tremendous expectations. Tom Wopat, who was excellent in the easily forgotten personal favorite A Catered Affair, is once again spot-on as Frank Abagnale, Sr., equal parts washed-up sponge and sympathetic, well-intentioned has-been. Wopat simply makes you feel his character's flawed pain like few other actors. And Kerry Butler, who I regrettably prefer to avoid after being scarred by her baffling performance in the unfortunate Xanadu, is used to the best possible extent in her few scenes with Frank and her family to the point that I enjoyed her presence in the show, something I frankly never thought I'd say. And then there's Aaron Tveit. Why this young man has escaped Tony nominators' radar twice now (for Catch Me and for his haunting performance as Gabe in Next to Normal) is completely beyond me. In Catch Me, he is pitch-perfect (vocally and figuratively). I haven't seen another performer on Broadway this season who has the show on his or her shoulders the way Tveit does, and he makes it look effortless. He oozed charisma, made the complicated Frank, Jr. eminently likable while still deeply flawed, and absolutely carried every second of the show. I can't say enough about his performance or how boggled I am that it has failed to be recognized in this awards season. Tveit is magnificent in this production and even if the rest of the show were awful, his performance alone would be worth a full-price ticket. Go, go, go! Catch Me If You Can ended up charming me in a way I never would have expected, making me believe in the future of the non-genre-busting modern musical. Yes, if you want to be shocked or need an in to Broadway if you don't normally like musical theater, you should go see the excellent Book of Mormon. But if you want to see what the classical musical looks like in the twenty-first century, rush on over to the Neil Simon Theatre and prepare for an extravagantly satisfying few hours.